If you haven’t tried jigging spoons for hard water walleyes yet you really are missing the boat. 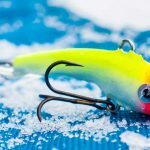 Serious ice anglers have found that a jigging spoon in the right hands can be absolutely deadly and has proven to be one of the season’s top producers. To become a successful spooner some early success can go a long way as it’s hard to stay with something new long enough to build the necessary confidence. Confidence is critical and will come every time you bust a big eye on a jigging spoon. As your confidence builds the spoon will soon become your go to bait and will be the first lure down the hole every time your on the ice. You can give your confidence a boost by using the right spoon in the right place at the right time. The right time is as early as you can get on the ice, the right place is classic walleye structure, and the right spoon is one that produces flash and noise like the Northland Tackle Buck-Shot Rattle Spoon. The Buck-Shot has built in rattles that create plenty of fish attracting noise and comes in some terrific colors. It’s long slender shape mimics soft finned minnows which is a forage type that walleyes find most desirable and comes in several sizes including 1/16oz on up to 3/4oz. The size you choose really depends on how deep you’re fishing and the idea is to use as light a bait as you can while still getting the job done. There’s a rule of thumb that says you should use a big bait for big fish but it doesn’t seem to hold up on ice, in fact my biggest walleyes have come on smaller lures like the 1/8 oz Buck-Shot. Good electronics are another key to mastering the use of a jigging spoon and is where a flasher type depth finder like Marcum’s LX-5 is worth its weight in gold. The LX-5 will let you see if you’re on fish and how they react to what you’re doing and give you a chance to adjust. If you’re seeing fish and getting smacked then there’s no need to change. But if you’re seeing fish and not getting hit or chasing them off then you might have to experiment a little to find out what it is they really want. You can also get a good idea of what’s going on by watching the action on a LCD screen combined with an underwater camera like Marcum’s new VS 825C. The VS 825C has a color LCD screen that can be viewed in direct sunlight and is going to change how often the cameras get used. To be effective with the spoon a good technique is in order. The basics begins by dropping the bait to the bottom and then working it up from there. After the bait has reached the bottom; reel up the slack so that when you lift the rod tip the spoon is a half foot or so off the bottom. At that position give the spoon a sharp snap up and follow the slack line back down with the rod tip until it returns to the start position. The spoon will flutter down and is when a lot of strikes come. A strike may be felt but more likely you’ll see a twitch in line, or the bait won’t make it all the way down to the starting position, or she might just be there when you start your next snap. In any case; set the hook. When a walleye hits a spoon he has taken it as deep as he’s going to and waiting to set will increase the chances of getting the bait rejected. If the spoon makes it back to the start position then wait a moment and let it settle out. After a moment try giving the bait a tiny bump or nudge and wait again. Quite often the hard snap will draw fish in and the little nudge will trip their trigger. Fish that are extremely active will inhale a spoon without any other dressing but more often than not you’ll probably have to add a little meat to get the job done. The meat could be a small minnow, a piece of a larger one, or a wax worm or two. The key to using minnows is not to overdue it as you don’t want to effect the action of the spoon. Too much minnow will slow the fall and stop the flutter and kill the fish attracting action. Remember, the spoon is the real attraction and all you’re adding is a little scent and texture. Wax worms aren’t really thought of as walleye bait but on a spoon they can definitely be effective. If things get a little tough and minnows aren’t producing a wax worm just might do the trick. When walleyes turn on they will often come in bunches and there’s no quicker way to put a couple of eye poppin’ eyes on the ice than with a jigging spoon. They can also go away just as fast as they came and it’d be a good idea to be prepared. Having a second spooning rig ready to go might be a good idea and could mean more fish caught, especially if a big walleye messes up what you’re using. The key to effective spooning is to get with it and stay with it. The more you use it the more you’ll use it. The next time you get on the ice; get with it and get spooning.